…you never know what you’re going to get in each handful! I know, I know…you think I made a mistake right? It’s suppose to be a box of chocolates, not a bowl of trail mix! What ever am I thinking?? Well let me tell you. First of all, I removed the box because I really prefer not to purchase any of my food in boxes. Typically boxed or packaged food means low quality and highly processed. These days, I get a kick out of making my own trail mix by wisely choosing the yummy ingredients one by one and placing each one into their separate little recycled baggies until I can get them home to mix them. In life, it is important to remember that we don’t have to take things as they come. We can choose not to take the pre-packaged experiences, and instead, create our own! We can take pieces of this philosophy, that belief system, and few dashes of our own intuition, and create something balanced, colorful, full of all the nutrients we need, and most importantly, something that is FUN and feeds us in every way! I love creating my own recipes because it reminds me that life is my greatest recipe, and it teaches me that I can mix whatever ingredients I feel would make a yummy experience. 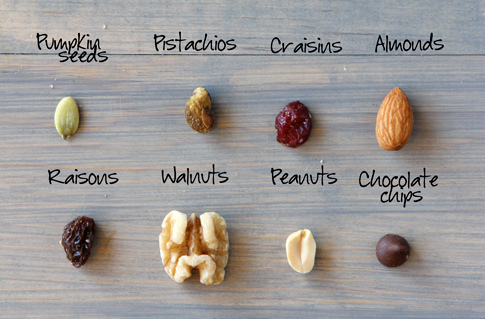 I can make the same trail mix every time OR I can try different ingredients just because I CAN! So, are you buying pre-packaged experiences or are you creating your own? Don’t worry, there are no wrong choices. Some will appear to taste better short-term and create discomfort long-term. Others will taste healthy now, and perhaps feel a bit uncomfortable in the short-term, yet they will create energy, vitality, and soul-full expansion in the long-term. Some will just taste like ecstasy now and bring nothing but joy to your day, every day, while others just won’t do anything for you, never have, and never will. It’s all a matter of preference and YOU are the Head Chef. You get to choose the ingredients of your life. You get to have fun doing it and enjoy every bite of it. Therefore make the most of your power to create your wildest recipes! I prefer to mix it up so the fruit laces every bite, but is a lesser proportion than the nuts and seeds, to create a higher protein, lower sugar combination. Again, I am always trying something new depending on the day!